Safeguard® 53800 Turtle Trap (53800) Northern Sport Co.
Over the past several years, millions of homeowners have enhanced their residential landscaping to include a pond and exotic fish. Unfortunately, these ponds can become a haven for wild turtles that create a hazard for the pond and it's fish. This unique trap has been designed to be used in multiple applications. The trap can be used as a floating trap, capturing multiple nuisance turtles in the water and retaining them so they can be removed from the property. 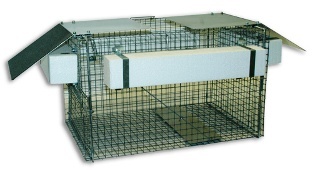 The trap's innovative design also allows it to be used on dry land in applications where a land trap is needed. Extra shipping is $19.95 for this trap.